What's the average humidity in your guitar's case? If you had the Oasis Digital Hygrometer you'd know precisely! Oasis knows that the number one cause of lackluster performance in acoustic instruments is low or high humidity - it can even damage your instrument if left unchecked in the long term. 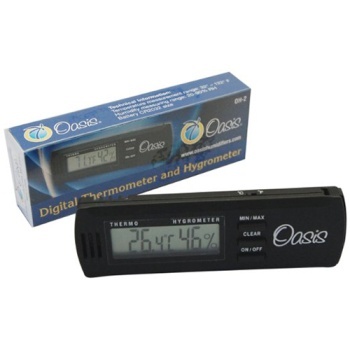 Just place the Oasis Digital Hygrometer in your guitar case, and you'll know instantly what the humidity in your case is, helping determine when to add a humidifier. Keep your acoustic guitar at top-notch performance, with help from the Oasis Digital Hygrometer!